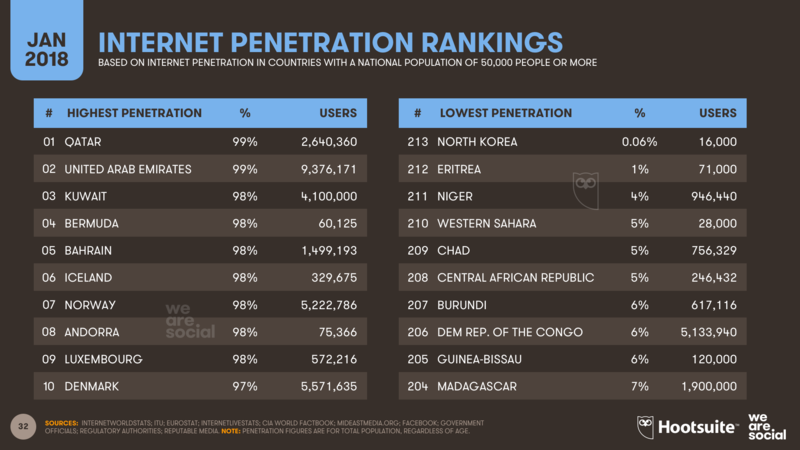 Their extensive report reveals that there are now more than 4 billion people around the world using the internet; so well over half of the world’s population is now online. With the latest data showing that nearly a quarter of a billion new users came online for the first time in 2017. Much of this year’s growth in internet users has been driven by more affordable smartphones and mobile data plans. 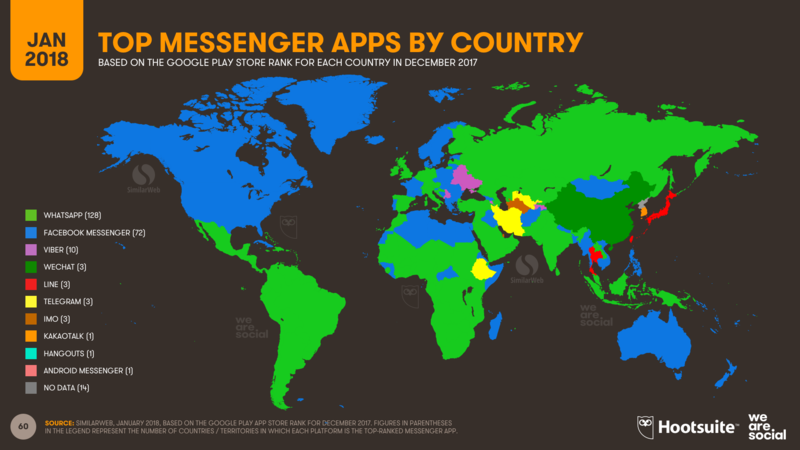 More than 200 million people got their first mobile device in 2017, and two-thirds of the world’s 7.6 billion inhabitants now have a mobile phone. More than half of the handsets in use today are ‘smart’ devices too, so it’s increasingly easy for people to enjoy a rich internet experience wherever they are. 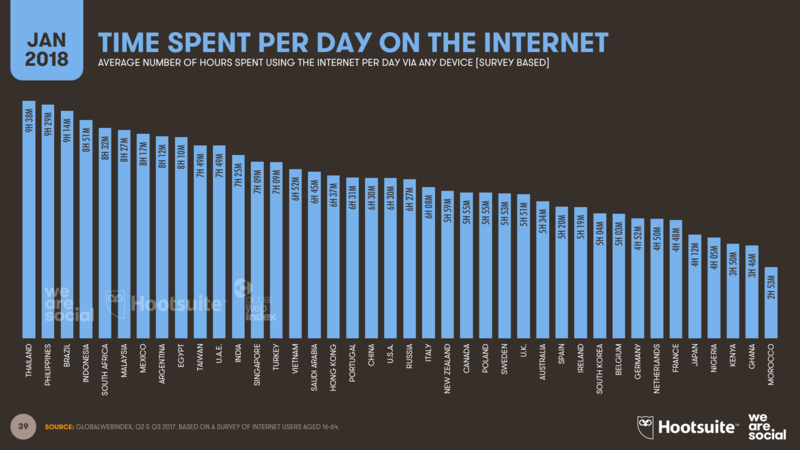 The latest data from GlobalWebIndex shows that the average internet user now spends around 6 hours each day using internet-powered devices and services – that’s roughly one-third of their waking lives. Added together for all 4 billion of the world’s internet users, people will spend 1 billion years online in 2018. 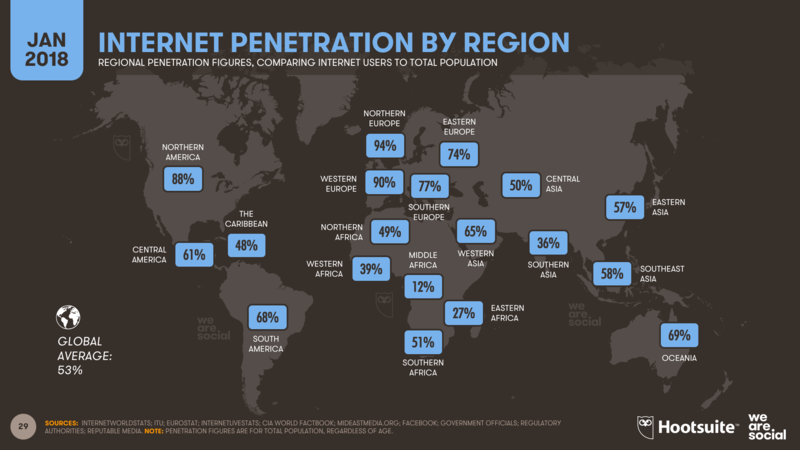 Internet access still isn’t evenly distributed around the world, but things are starting to change. These changes will have a profound influence on the future of the internet. 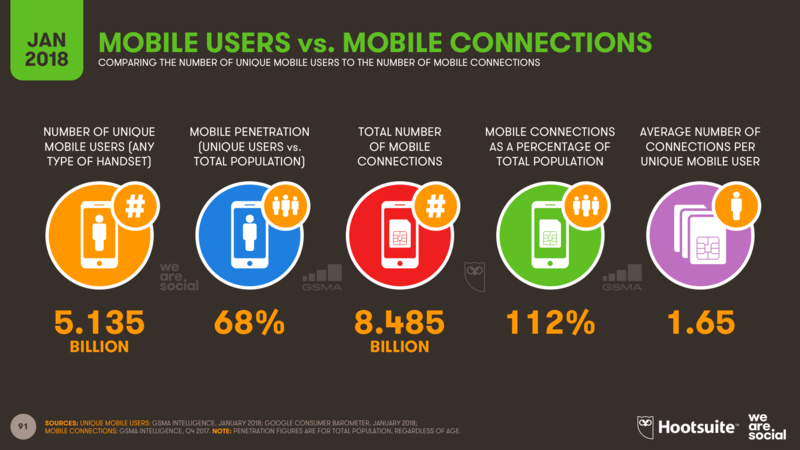 More than two-thirds of the world’s population now has a mobile phone, with most people now using a smartphone. 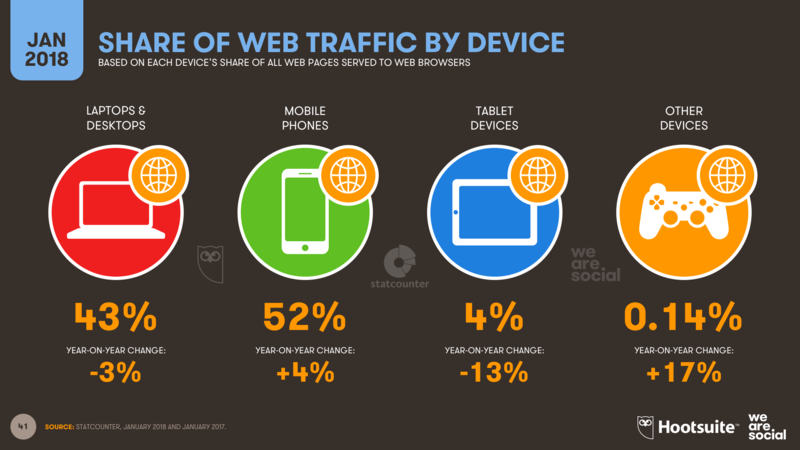 Smartphones are the world’s preferred choice for going online, accounting for a greater share of web traffic than all other devices combined. 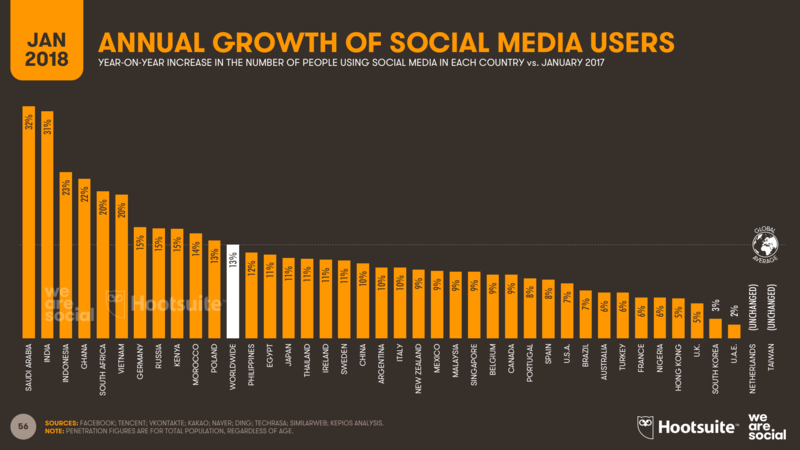 The global number of people using social media has grown by 13 percent in the past 12 months, with Central and Southern Asia recording the fastest gains (up 90 and 33 percent respectively). 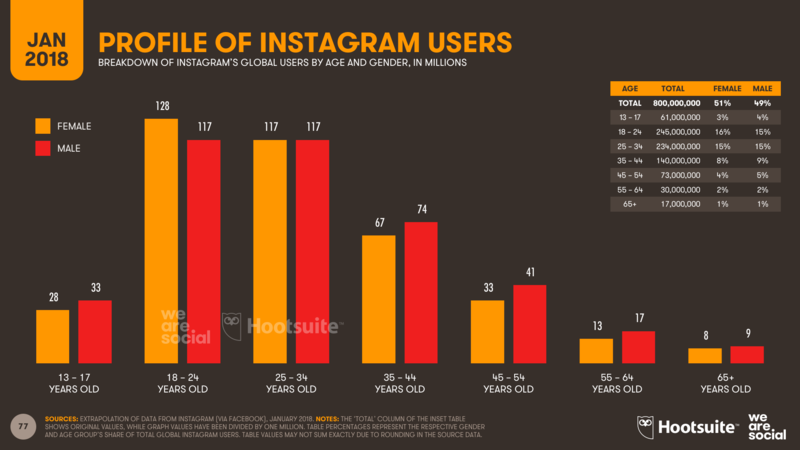 As part of this growth, we’re seeing larger numbers of older users joining social media too. 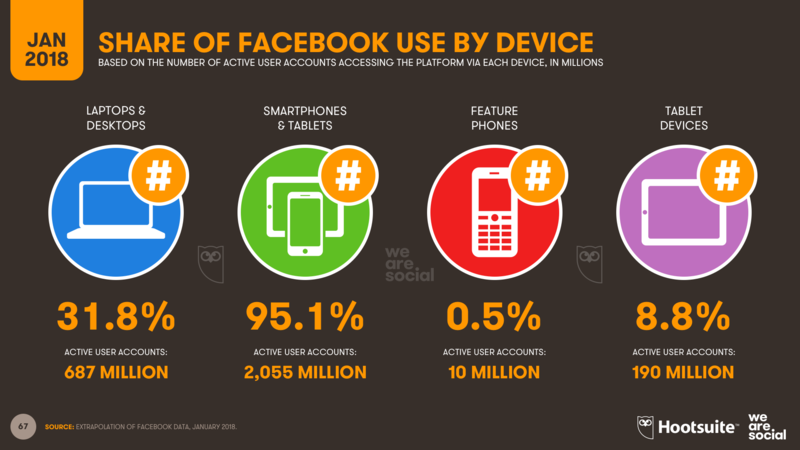 On Facebook alone, the number of users aged 65 and above has increased by almost 20 percent in the past 12 months. The number of teenagers using Facebook has also increased, but the number of users aged 13 to 17 has only grown by 5 percent since January 2017. 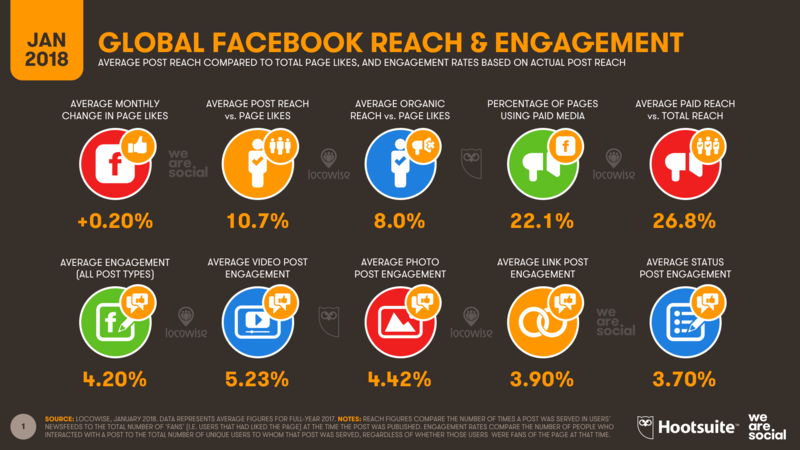 Details of Facebook reach and engagement for 179 countries around the world show that, as expected, organic reach and engagement have both dropped over the past year, with average reach down by more than 10 percent year-on-year. Despite the negative trends, these numbers will be valuable benchmarks for marketers everywhere – especially because they offer insights into the number of brands using paid media. 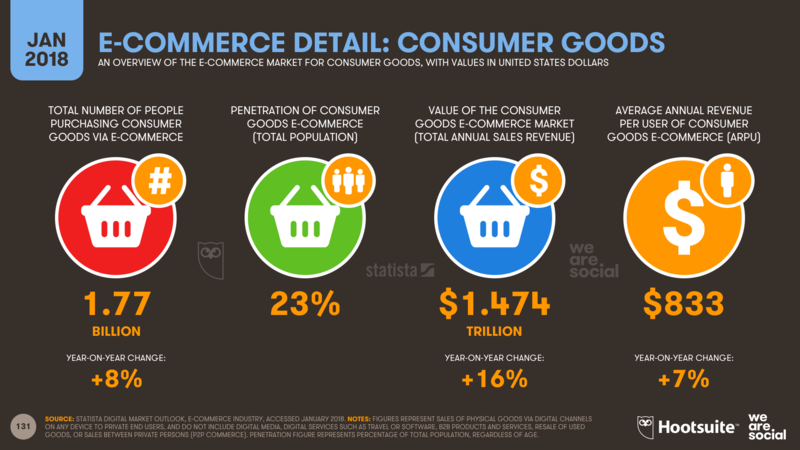 The latest data from Statista’s Digital Market Outlook shows that the total value of the e-commerce market for consumer goods grew by 16 percent over the past year. Total annual spend in 2017 reached almost US$ 1.5 trillion, with fashion products representing the largest single category. 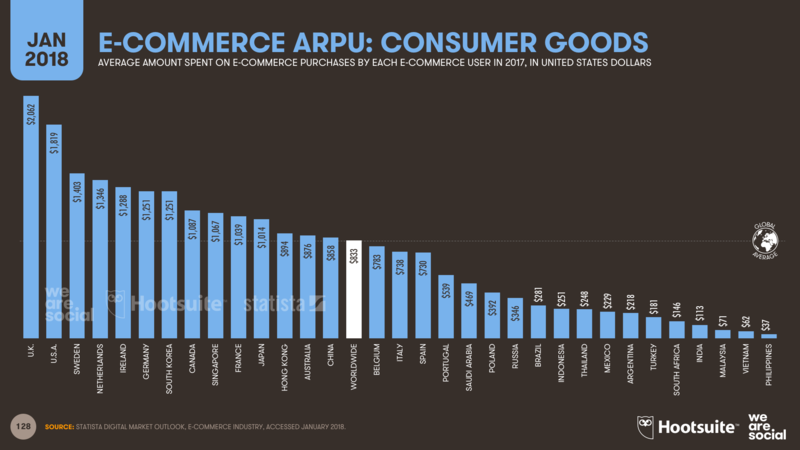 The amount that each person spends on e-commerce is also growing, with average revenues per user (ARPU) up by 7 percent year-on-year to reach US$ 833. The British are the biggest e-commerce spenders, with annual spend in the UK now greater than US$ 2,000 per user. It is worth highlighting that these are just the figures for consumer goods too; if we add spend on other categories such as travel, digital content, and mobile apps, total global e-commerce value is likely to be closer to US$ 2 trillion. 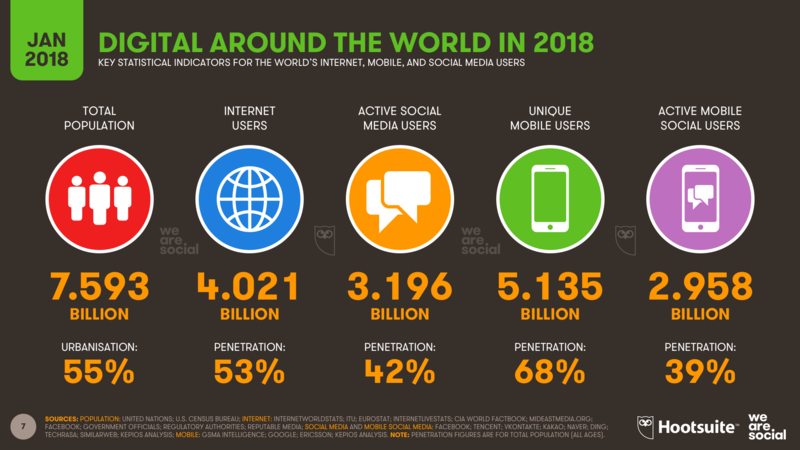 The 2018 Global Digital report offers much more insights and details in about 5,000 charts and in-depth data for more than 230 countries and all the essential numbers you need to understand internet, social media, and mobile behaviors all over the world. 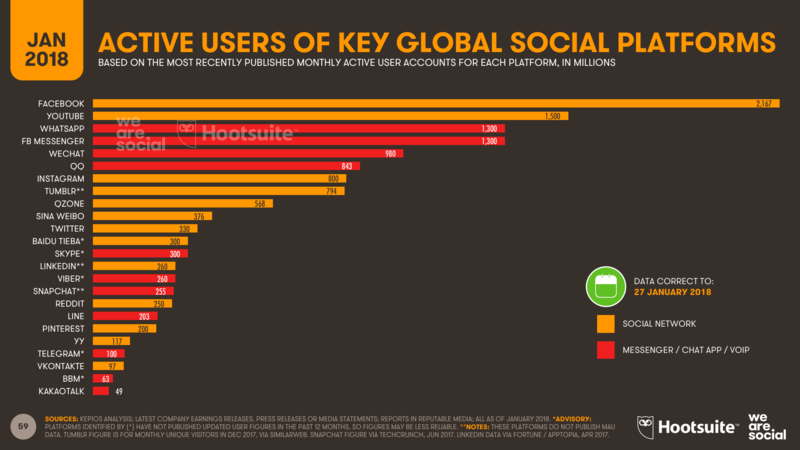 Thanks to We Are Social and Hootsuite for putting together these exciting information and delivering such valuable insights! With regard to these research results do you want to rethink and optimize your Internet and Social Media presence? Or would you like to develop and implement a holistic Social Media and Online Marketing strategy? Then we at Simone Philipp Management are glad to help you!